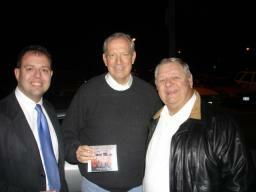 Fritz and Fred are pictured here with NYS Governor, George Pataki, on November 6th in Rome, NY. Note the FPB CD Governor Pataki is holding. Frank and Fred are shown here with Lena, and her two daughters, after FPB's cranking set at the Norwich Pumpkin Festival in Norwich, NY. Fritz is pictured here with his Excelsior in Norwich, NY on October 28th. Fred poses with the FPB/Jagermeister pumpkin at the Norwich Pumpkin Festival on October 28th, 2006 in Norwich, NY. Frank poses with his new Gretsch on October 28, 2006 in Norwich, NY. Fritz presents Mary Lou Steward with an FPB/Jager t-shirt, prior to FPB's set at the Norwich Pumpkin Festival on October 28th. Frank and Fritz (wearing an official FPB/Jagermeister winter cap) are pictured here with special guest drummer, George Staley, prior to the start of FPB's outdoor gig on October 28th in Norwich, NY. Fritz (what kind of facial expression is that?) and Tom (on bass) are shown here during FPB's gig at the Hotel Solsville in Solsville, NY on October 22, 2006. FPB Fan Club Member, Bob Zeller and Fred yodel a tune during FPB's performance on October 22nd. Fritz, Rick, and Gabe goof around during a tune on October 22nd in Solsville, NY. Fred and Fritz are shown with their Excelsiors during FPB's gig at Hotel Solsville on October 22, 2006. Tom and Fred are pictured here on October 22nd in Solsville, NY.